I have reopened the Mind2Tests project. I wanted to work on it earlier but I focused on the SQLite Sorcerer and other stuffs. Just to remind you, this little AIR application helps software testers in their test design activities: it converts mind-map files (from FreeMind and XMind) into XML files that can then be imported into TestLink (v1.8x). By this way, the mind-mapping becomes another powerful test design technique. 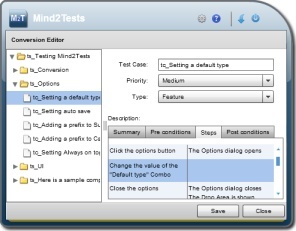 Implementation of a plug-in system: external libraries will be downloaded to allow Mind2Tests to work with a specific tool (mind-mapping or test management tool). And as a starter, 3 or 4 libraries will be provided to work with FreeMind, XMind and TestLink (v1.8x and probably v1.9). The way the mind maps can be designed is improved in order to accept nested requirement specifications or nested test suite. So the user will have more freedom to organise the mind-map before the conversion. The 2 first points will allow testers to extend Mind2Tests with new capabilities for other tools or their own home-grown tool. Nevertheless, I still don’t know if I will charge (very low charge) for libraries for non-open-source tools (as Mind Manager, Quality Center for instance). I can’t commit a date but the release should come in late February 2011. 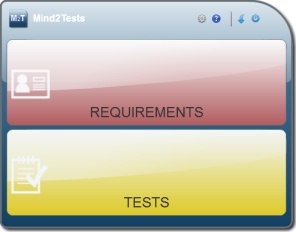 Mind2Tests is an application developped for AIR. Its goal is to accelerate the generation of tests by creating a bridge between mind mapping tools and test management tools. The very early versions were developped on Flex SDK 3 but I changed my mind and finally used this projet as an introduction to Flex 4. As I love challenges, I also used for the first time the now famous MATE framework. At the moment, the application can convert FreeMind and XMind files to TestLink xml files by a simple drag and drop. I still have to finish the custom updater and fix a bug that is probably due to the SDK 4 on beta. The sources should be open and an online help will be available with mind map samples. to accelerate the feed of your preferred requirement or test management tool by creating the bridge between your mind-mapping tool and your requirement or test management tool. To do so, Mind2Tests converts mind-map files, generated by your own tool, to xml or csv files that can be imported in your requirement/test management tool as requirement specifications or test suites for example. And this, as simply as a drag and drop of files. Who should/can use Mind2Tests ? Mind-mapping enthousiats are of course the best candidates, whatever they are software testers or business analysts, product owners or project managers. The formers will be mainly interested in converting mind-maps to test suites, the other will convert the requirements / use cases / user stories of their product or project as a breeze. And if you have never used mind-mapping, hurry up and download one of the supported tool, the benefits and the applications of this technique are unlimited. Why you should use Mind2Tests ? Mind-mapping is a natural, easy and fast way to collect and organize information. Quick way to collect the acceptance tests from your Product owner or to define the functional tests of a touchy feature with your test team. Mind2Tests is not a new mind-mapping tool to learn, it just use the files and the capabilities of your preferred tool. The conversion process works like a breeze, drag, drop, save… and import from your test/requirement management tool. Mind2Tests can be used in any context: from large organizations with heavy processes to small or medium teams working or not in an Agile mode. Nested specifications or suites are allowed. A simple recommendation will help ! You will also need Adobe AIR to run the application: Get it HERE. Donations are welcome ! Donate just if you want and if you think this application is really worthwhile for you. Have a look on the online help to learn more on Mind2Tests. The online help contains some video tutorials.